We started from Lavender Central – the village of Sault – made the little descent down the the wide valley at its foot, and the climb was on! The group rode together for a while, but Wayne slowly fell behind, hiding some ‘issues’ he had with his rental saddle that would come to the surface in due time (the issues, not the saddle..). 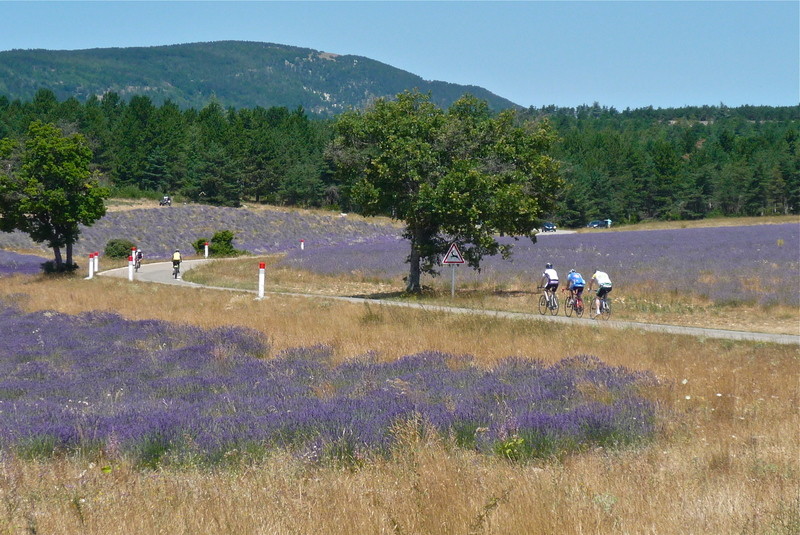 Here are Greg, Yasha and Mark, riding through the lavender. 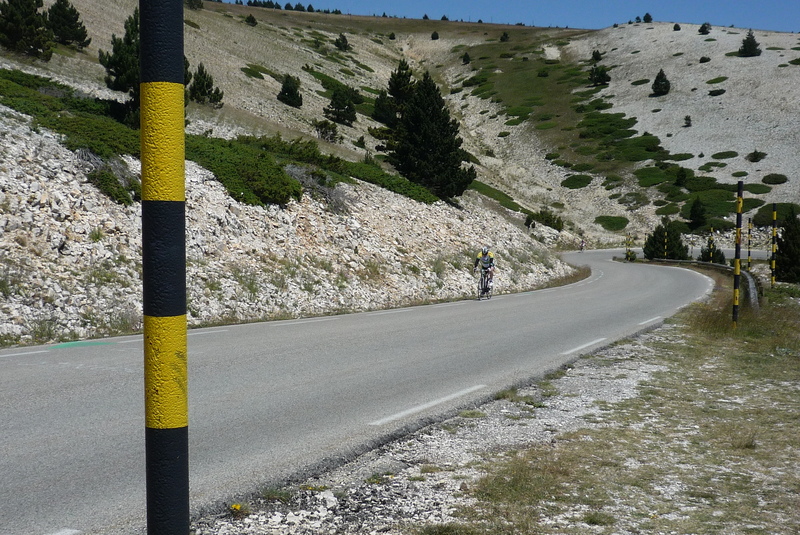 I made strategic stops along the route to capture those Kodak Moments one wants on a legendary climb like Ventoux. My camera, however, had other ideas, and it crapped out momentarily when Wayne passed by the picturesque chapel. All I could manage was his back. At the spot below, a few minutes after the ‘escape group’ passed, Wayne’s problem came to light. It seemed that his saddle was hitting a nerve ‘down below’ and he couldn’t continue with the pain the way it was. 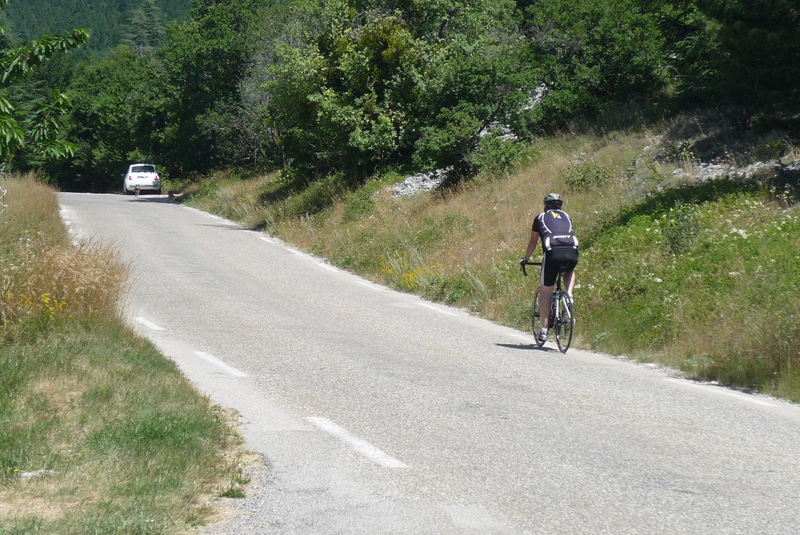 We quickly racked his bike and chased down the rest to see how they were doing. They were doing so well that they beat us to Chalet Reynard. Here, we had a little strategy meeting about the last 6km of the climb (the tough part with the Sault ascent) and the final three were off. 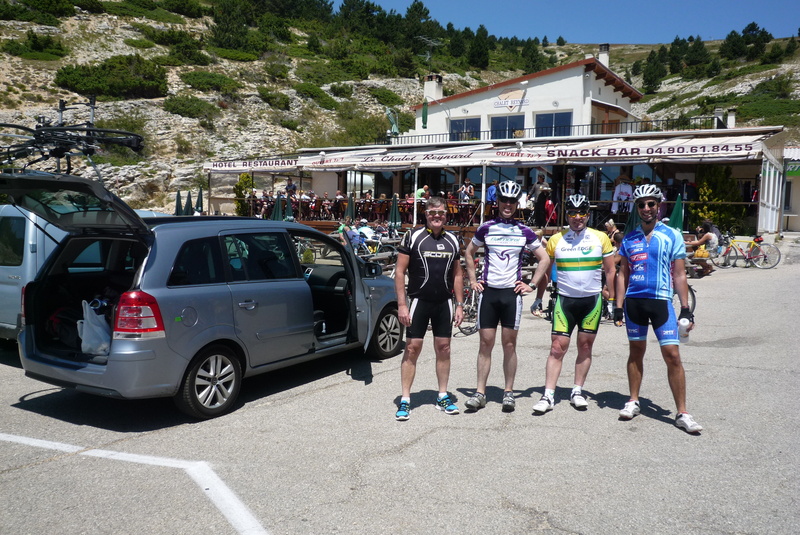 Mark is no climber, as evidenced by his massive sprinter thighs, and a selection was made quickly on the steep moonscape of Ventoux. Here is Yasha pulling Greg up the mountain (his words, not mine!). Not long after, Mark came up, sporting a good, solid cadence and a fearsome look of determination. 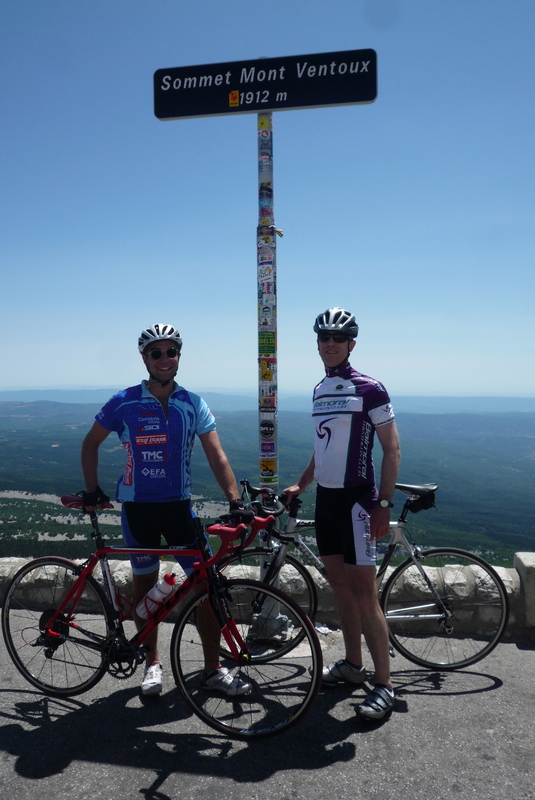 Wayne and I once again missed the boat and reached the summit of Ventoux moments after the front two. At least I was there before they decided to descend and could get a photo. Then Mark made his way up the steepest part of the climb, right before the last right-hander, with some nice fan support! And got his own victorious digital keeper. And the wind, you ask? Hardly a lick of it to be felt up top. I have no idea why because it was raging at the bottom of the mountain, but I’m not going to dwell on it because the conditions were ideal for us the whole ride. Thanks guys for contacting me. When you’d like to try the Bédoin side (I know you do! ), let me know and I’ll be happy to follow you up. And Wayne, don’t forget your saddle! 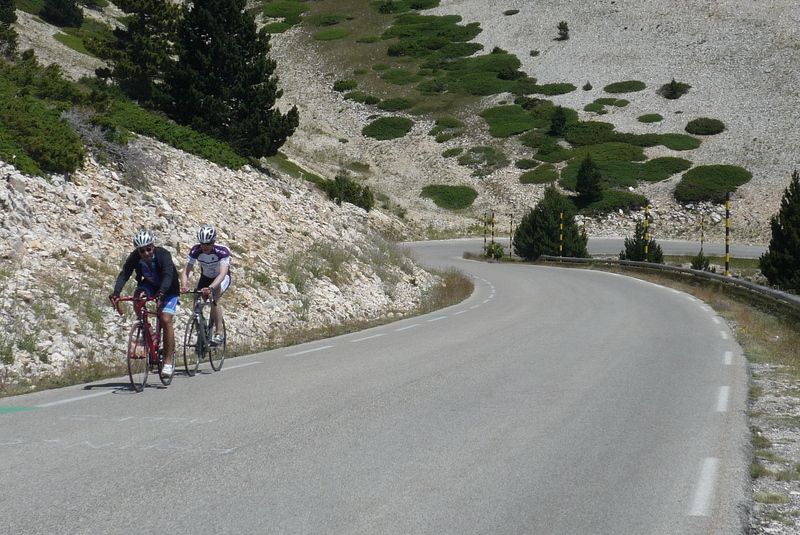 This entry was posted in Cycling, Guided Rides and Tours, Mythic Rides / Climbs and tagged Mt. Ventoux. Bookmark the permalink. Nice shots! I know how Mark feels. It wasn’t too long ago that I was the laggard, but all that hard work makes the summit taste better. Well done to the team for making it to the top. One day I hope to be posing at that sign. You’ll smash it, Aaron. Tell me when you’re in the area and I’ll be happy to ride it with you. If (when) we are in the area, we’ll hire you. Much easier that way. Still not positive whether it will be 2013. I would like it to be, but there have been a couple other invites we are considering. Will know for sure around the end of this year. Most Aussies, I think, don’t really comprehend the sheer difficulty of rides like this. Sure, we have Baw Baw, but this is on another level. Can throw Canadians and Americans into that mix, too, I’m sure. 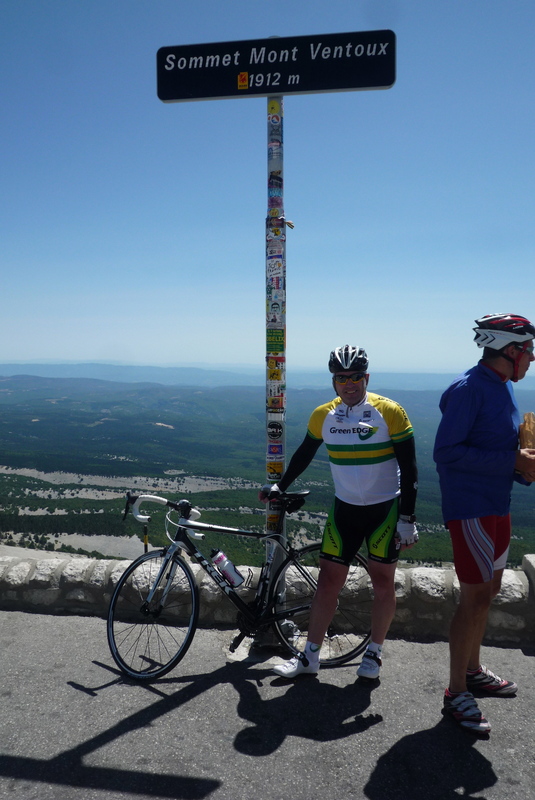 Really there aren’t many people out there with a climb like Ventoux in their country. Even the two Colombians I’m guiding at the moment said their mountains are long (one climb is 80km! ), but the gradients are low, in general. I see what you mean about lavendar central in your photos. What an amazing site. And well done to the four of you for getting to the top. 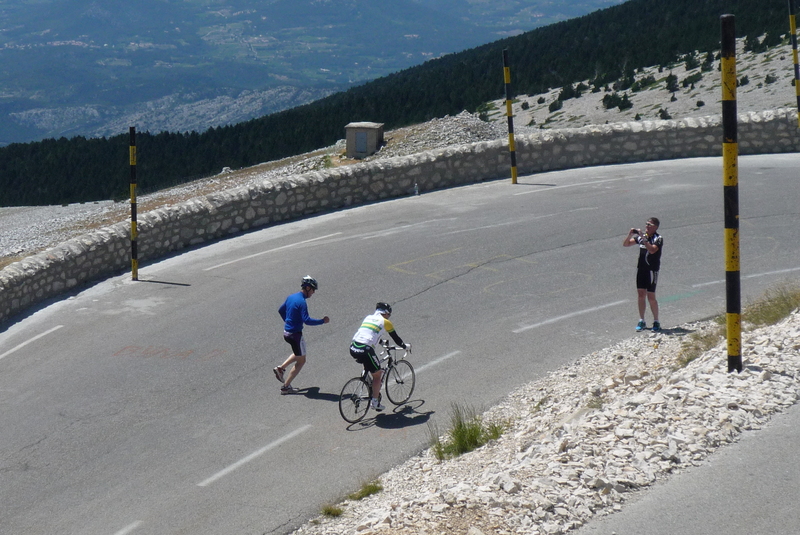 Now, that’s how I like to ride up Ventoux…in a total reversal of roles, I am the photographer! And the lavender fields are not to be missed.